I have been working on a number of projects lately, not all writing related so I thought I’d share a little here. Kobo is having an end of winter sale! 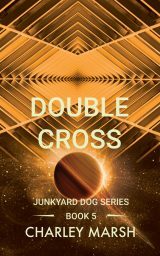 Selected books in every genre are priced below $3.99 through March 25th, including the 5th book in the Junkyard Dog series, Double Cross. Double Cross takes place on the galaxy’s only banking planet ZetiTau. Run by a strictly regulated society who’s only industry involves taking in valuables and issuing the credits used galaxy-wide, the Zeti-Taus expect customers to show up, make their deposits, and leave. Naturally Rita King and her companions stop by on the one day things don’t go as planned. You can get Double Cross for the sale price of $1.99 from Kobo only until March 25. Click here to go to the sale. I know. What do any of those things have to do with one another? Not much, really. But today is another snowy day and I took time from writing to watch the UCONN Husky Women beat USF in the American Athletic Conference semi-final.